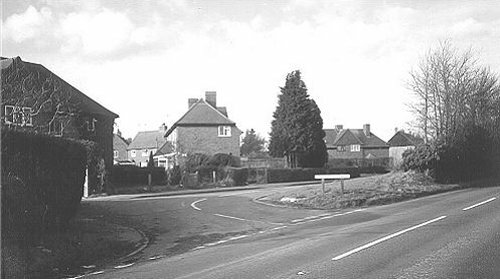 I was born at Deadmans Cottages, Guildford Road, Normandy located opposite Anchor Close, the site of which was "The Anchor" public house, demolished in July 2000 and the land redeveloped for the present houses. A Walnut tree, of which I recall so well in the garden of the pub, survived both demolition and redevelopment. In 1938, when I was two years of age, the family moved to a new Council House at 2, Walden Cottages where I lived until my marriage in 1957. The house had four bedrooms but no electricity, despite it being wired for such. The electricity supply cables to the area had not been laid due to essential materials being kept for the impending war effort. It was very frustrating to have all the switches and cabling but no electricity. We had gas light in the main three downstairs rooms and two of the four bedrooms but elsewhere; it was candles and torches, if you could find the batteries. Electricity was connected eventually in 1947. In Westwood Lane, roughly opposite the present entrance to Westwood Place (the former home of the Cousmaker family) is a track which, because of the huge Elm and Oak trees lining either side was known as "The Avenue", leading to Station Road since re-named to Glaziers Lane. Although the track is officially un-named it is known as The Avenue to the present day. On a summer evening it was usual for the family to walk to the British Legion Club via The Avenue and Station Road but unbeknown to us a Searchlight Battery Post had been hurriedly established in Station Road opposite the Telephone Exchange and adjoining The Avenue. We went as usual along The Avenue but were stopped by a sentry in Regular Army uniform and clutching a Lee Enfield rifle. My Mother insisted that he should let us pass but he had his orders and even though there was a lot of gesticulating and waving of Identity cards on our part we were forced to turn back. The War had come to Normandy. Although "The War" at that time was considered to be a 'Phoney one', it was the first time we had experienced it at first hand and it became very real to us at that point in time. Sadly, the family had a taste of real war when Jack, my eldest brother, failed to return from Dunkerque. 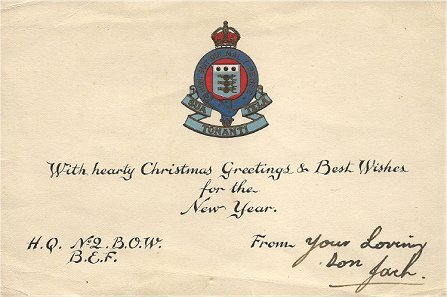 He was in the RAOC attached to the Coldstream Guards. We were visited by a fellow Coldstream Guardsman who saw Jack in the water but Jack could not swim and eventually he was reported missing. We kept hoping that he had somehow managed to hole up somewhere. 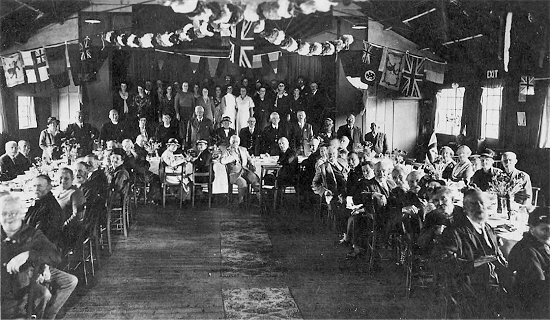 At the end of the war the British legion arranged a trip to France for all next of kin and family members of "The Fallen", for whom there was no known grave. My mother applied to go. The British Legion stated our mother was not eligible because Jack was buried in a mixed Civil/Military cemetery at a small town called Marquise between Boulogne and Calais. Eight members of the Royal Air Force are buried in that cemetery; all killed on the same date. They were the crew of a Lancaster, and very much like our Jack, were just 30 miles from England but failed to return. I can remember being woken by a string of explosions, which later we were told was caused by three bombs being dropped and which exploded in fields either side of Westwood Lane. The craters can still be seen if you know where to look. They were probably intended for the Searchlight Battery in Station Road. One bomb was dropped in the field opposite "Westwood", almost exactly in line with the main entrance door to the house and 150/200yards short of it. Another landed in an adjacent field north of the first one towards the Guildford Road and the third one landed about 200 yards behind the house towards Ash and on roughly the same line but only about 300 yards from the group of six houses at Waldens Cottages. From post war information it seems that the German bomber route was from Holland, turning left to follow the Thames to drop their bombs on London. Any bombs remaining would be dropped on targets of opportunity on their return course towards Portsmouth and the coast. The Searchlight Battery might well have been one such target. I was fast asleep and was woken by a very loud bang. I sat up in bed and saw our cat standing very stiffly on the window sill with its tail very stiff and up-right. That did not seem possible because the last person to bed always put the cat out and locked the door. She was staring through the window at a red/pink glow coming from the direction of the garden. It was around 3 am and after a family discussion and the absence of any noise, or further bangs, we all went back to bed. The next day, after school, my good friend Dennis Hunt and I decided to see where the bomb had landed. Our route to the site was along a tractor track, which led from the Guildford Road across the fields, one of which was where the bomb crater was. As we drew nearer to the bomb site in the cabbage field, we could see where a fresh, enormous hole had been made in the ground. There were shards of shrapnel scattered all around. We each picked up a piece up and made our way to where several people were inspecting the crater and the various bits of metal around. We stood behind P C Collins (our Village Bobby) but he soon spotted us and yelled for us to, "Clear Orf". I still have that piece of shrapnel. It has been to my children and grandchildren's schools as a part of their respective studies of the Second World War. It has been said elsewhere that the flying bomb had landed in the sewerage pumping station but factually it landed 300 yards short of that. This was very fortunate because the cabbages were blown over several hundred yards of ground and if the sewerage had been blown that far then the nearby bungalows at Elm Hill would have been uninhabitable for a long time! 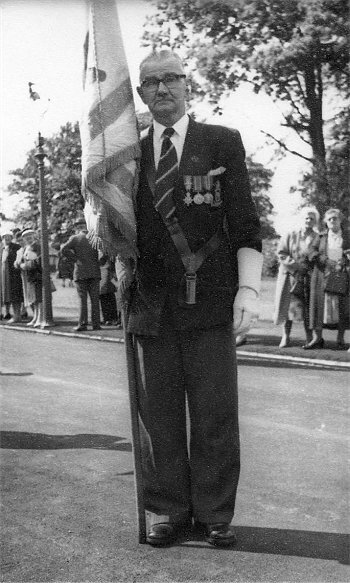 My father, Alan Philip Oliver, known around the village more familiarly as Alan, was for many years the Old Contemptibles Standard Bearer.